Kuala Lumpur airport (often referred to as KLIA) is the main international gateway into Malaysia for international visitors arriving by air. This huge complex is located in Selangor –in its Sepang District to be precise- and 45 kilometres separate it from the city centre. The hub serves as operational base for the flagship carrier Malaysian Airlines and, according to reports, it presents the highest numbers of passenger traffic in the country thus ranking amongst the 25 busiest airports in the world. For nomads, tourists and business travellers in Asia as well as for those coming from overseas, layovers and stopovers in Kuala Lumpur are frequent, and when this implies staying overnight in the passenger terminals to make a connection first thing in the morning, the best thing they can do is find a cosy place to rest in KLIA that suits their specific needs. Kuala Lumpur airport has two passenger terminals: the main building –known as KLIA– with a contact pier and a satellite terminal, and a supporting building called KLIA2. The main terminal handles Malaysia Airlines operations along with those by all major international airlines flying to this destination. 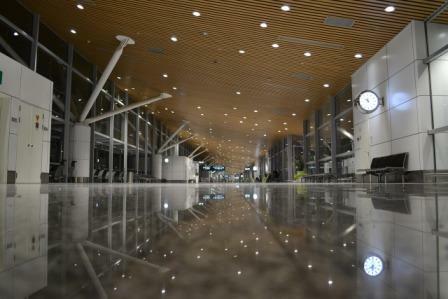 The satellite terminal also focuses on international routes, features a shopping concourse with Duty Free stores and luxury brands and can be reached by Aerotrain from the landside. The area in between or contact pier is actually an expansion of the terminal from which both domestic and international flights depart. KLIA2, the secondary terminal in Kuala Lumpur airport, is eminently domestic and the home to low-cost airlines in this Malaysian air hub, yet it comprises key facilities for travellers such as a ground transportation centre where buses, taxis, private shuttles and car rental offices are located and an adjacent building that functions as a shopping mall. If your layover in Kuala Lumpur airport of Malaysia will only last a few hours and you feel like shopping while in transit or simply take a short nap, look for the CARE ambassadors in the terminals and they will gladly provide directions to the nearest charging station where you can choose a comfortable seat, charge your electronic devices and relax. However, spending the night in KLIA or being more than six hours in transit will require a better place to sleep in Kuala Lumpur International. Fortunately, there are accommodation options available in the main terminal and KLIA2 both before and after security, and in case your flight takes off from the satellite terminal, you can get some good rest there too. Continue reading to find out more. This exclusive lounge in KLIA’s satellite building puts comfortable massage chairs at the travellers’ disposal so that they can relax and unwind before their next flight. Every chair incorporates power outlets to charge your electronic devices. For many, this has become an ideal place to spend the waiting time when their layover in Kuala Lumpur lasts between two and three hours. The Sama Sama Express is a 2-star hotel inside the facilities of KLIA, located after security and near Gate C5 in the satellite building. All of its rooms feature free Wifi, comfy beds, air conditioning, satellite TV, personal safe, tea and coffee amenities and a private bathroom. Notice that you will need a valid boarding pass to check in as this hotel in KLIA is only available to those in transit through the main terminal. Bookings are made by six-hour time periods. Passengers who will board an outbound flight operated by a low-cost carrier to either a domestic or international destination may stay in the airside transit hotel of the KLIA2 terminal, also a member of the Sama Same Express brand. It features convenient guest amenities such as the possibility to check in to your flight and get your boarding pass on site. Provided that you have plenty of time to kill before your flight and do not mind to stay on the landside, know that there are two hotels near KLIA, both directly connected to the passenger buildings by two separate elevated walkways. The Tune Hotel KLIA2 is a 4-star establishment offering well-appointed guest rooms with complimentary WiFi, laptop safe, work desk, flat-screen TV and ensuite bathroom with amenities. It has an onsite bar and a communal lounge where you may meet up with other travellers. Last but not least, the 5-star Sama Sama Hotel in Kuala Lumpur airport features an outdoor pool for guests, three onsite restaurants, a wide range of guest rooms and suites and free WiFi all throughout the premises: the kind of accommodation that will undoubtedly cater to your every need during a luxury vacation or long-haul journey. Even though you can walk from the main terminal to the hotel, the airport staff can provide buggy rides and shuttle services if you are carrying heavy luggage or do not feel like walking.